Usually on the Object of the Week blog we show you an object which you won’t be able to see in the flesh until we reopen, but this week’s object is one that you can, as it is going out on loan to an exhibition at the De La Warr Pavilion in Bexhill. Exhibitions seem to work in seasons, with galleries opening and closing exhibitions at the same time. Exhibitions that started at the beginning of the summer are closing now and new exhibitions are opening which means lots of paper work, packing and assessing the condition of objects. It’s great, as not only does a wider audience get to see the works in our collection and find out about us, but we build good partnerships with other galleries, so that if they have something in their collection that we want to show in Bedford it’s a lot easier to arrange. Our popular Toulouse-Lautrec exhibition was the result of just such a partnership with the British Museum. Examining the condition of a Warhol screeprint. ﻿﻿ This month you can see works from Bedford in Suffolk, Cumbria, Bath, Kent, Sussex, and if you want to travel a little further afield, Rotterdam in The Netherlands. 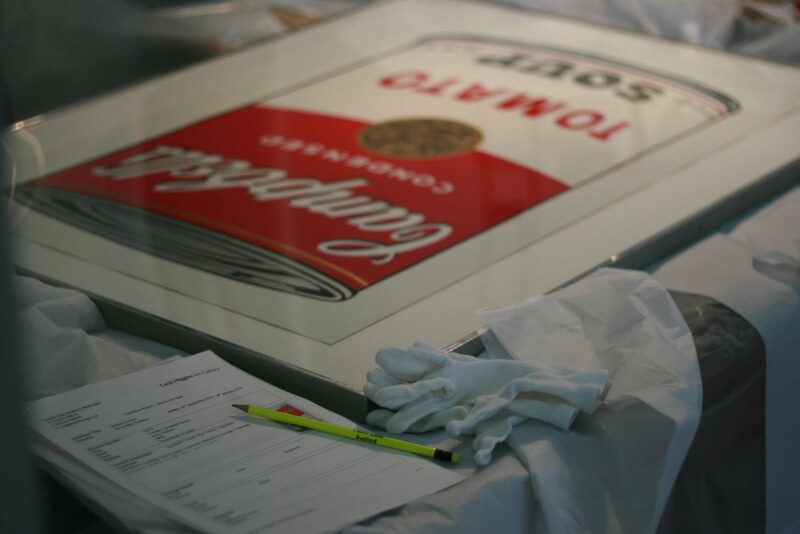 The Warhol is quite a straight forward loan, but it’s not unusual for our works to travel to several venues. Frederick Etchells ‘Progression’ 1914-15 has just returned from a touring exhibition which ended at Tate Britain, after previously being at Nasher Museum of Art in North Carolina and The Peggy Guggenheim Collection in Venice. Warhol’s ‘Tomato: Campbell Soup I’ will form part of the ‘Warhol is Here’ exhibition, which looks well worth a visit. Warhol first exhibited his iconic soup cans in Los Angeles in the early sixties as a series of 32 paintings: each one a different flavour from the Campbell catalogue, lined up on narrow individual shelves as if in a supermarket. Like Coca-Cola, Campbell had become an enduring image of American life, its label design had not changed in over fifty years and its price in almost forty. Through Warhol’s work it became one of the most recognisable images of Pop Art. On being asked why he decided to paint soup cans, Warhol answered “Because I drink it”.